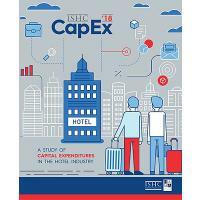 ATLANTA, GEORGIA – The International Society of Hospitality Consultants (ISHC), a leading source for global hospitality expertise, in partnership with the Hospitality Asset Managers Association (HAMA), has released the industry’s exclusive resource on hotel capital expenditures, ISHC CapEx 2018: A Study of Capital Expenditures in the Hotel Industry. “The CapEx 2018 book is the cumulative result of numerous partners, and it would not have been possible without the contribution of countless volunteer hours. We are thankful for the CapEx Committee, HAMA and STR helping us compile and synthesize this information to ultimately benefit hoteliers contemplating upcoming property projects,” commented Andrea Belfanti, executive director of ISHC.